No instruction manual could teach a golfer to play the extraordinary trees-to-green shot that Phil Mickelson produced at the 13th on the way to winning his third US Masters in Augusta. There is much a player can learn, nonetheless, from the winner of the 2010 green jacket and his phenomenal skills with wedge and putter in Mickelson's Secrets of the Short Game, which can now expect a spike in sales. Mickelson believes that even a golfer of only average ability can become a highly effective short-game player by paying proper attention to mechanics and set-up and combining that scientific approach with a willingness to be imaginative. Published last autumn, the 224-page manual passes on some of the wisdom Mickelson has acquired over 35 years, since his first steps in the game as a small boy. By holding off Britain's Lee Westwood, Mickelson joined the company of Nick Faldo, Sam Snead and Gary Player in having won three Masters titles. But for the presence of four-times winner Tiger Woods on the circuit, Mickelson would probably have been seen as a genuine great even before now. Given the trauma in his personal life in the last 12 months -- both his wife, Amy, and his mother, Mary, were diagnosed with breast cancer within seven weeks of one another last summer -- the 39-year-old American will be guaranteed a best-seller when he gets around to writing the full story. In the meantime, his 2005 autobiography, One Magical Sunday: But Winning Isn't Everything, describes, almost stroke by stroke, the 2004 US Masters triumph that ended his long wait for a first major title, with much about his life told 'between holes'. Not everyone knows... that 13 is clearly a lucky number for Mickelson, who played the 13th on the Augusta course in six under par over the four rounds, with two birdies and two eagles. 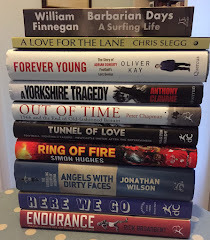 For more golf titles, visit The Sports Bookshelf shop.